There’s something to be said for the gentler pursuits in life. Like having a nice sit – what could be better? But gentle can also be pointless, like Radio 4 sitcoms. 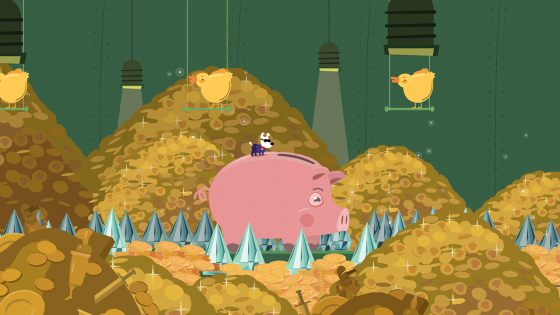 Which is Mimpi Dreams? LET’S FIND OUT. 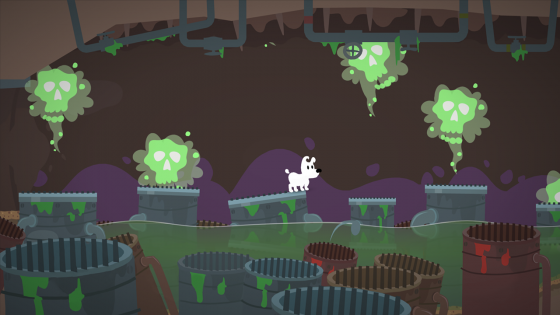 So: Mimpi is a lazy dog, who becomes a super-dog in his dreams, where he helps various gently odd characters with their problems, which are solved through a mix of gentle platforming and gentle puzzle solving. That’s not damning with faint praise – this is the good sort of gentle. The vector graphics are comfortingly smooth, and the conversations Mimpi has with the characters he encounters are endearingly represented by little drawings in speech bubbles. The atmosphere this builds is reflected in the gameplay which is, with only rare exceptions, unthreatening and unrushed. That’s not to say boring though. The humour – which, yes, is gentle – has the capacity to surprise, as do the puzzles. The puzzles aren’t quite as consistent as the feel of the game though. Most are single screen affairs, and though rarely conceptually complicated, there’s some neat lateral thinking involved – in some. Others are pure trial and error memory tests, and others still are more obtuse than they were probably meant to be. The problem is that it’s not always clear what is an object you can interact with – which you often do directly rather than through Mimpi – and what is background. More than once I knew what to do, just not precisely what the game wanted me to jab with my finger. The game keeps it simple though, so those bumps aren’t enough to stop the game being a bit of a gentle joy – until the last level, anyway. The Mars level is as long as the rest of the game and started to try my patience, one tediously long puzzle in particular. Short and sharp served the rest of the game well, so it stands out as a bit of an oddity – and indeed it was released as DLC on other formats, which goes some way to explaining. There’s no getting away from it, this was designed as a mobile game, which gives us a couple of issues. Firstly, this is not a game for the big screen – without being able to use the touchscreen as originally intended, even with motion controls, it’s a fiddly experience. And it’s still a bit of an oddity in portable mode: the physical controls for Mimpi are unquestionably an improvement, but it’s slightly cumbersome constantly switching between buttons and touchscreen. And secondly: the basic game – which is the more enjoyable first five levels – is free on iOS, Android and Steam. I will gladly argue that price shouldn’t come into the verdict – and it doesn’t, because there are a few hours of eminently enjoyable entertainment here. But are you going to spend £8.99 on it when you can legitimately get it for free on another format? That’s another question.